Double Thick, Easy to Grip Sponge With Integrated Scrubbing Pad. This popular cleaning tool is the same sponge that is included with every Quick N Brite paste or Scum Off purchase. It is the ideal tool for applying these cleaners, and scrubbing free any stubborn grime. Although it is perfect for use with those products, it is also useful for people that clean with other stuff too. 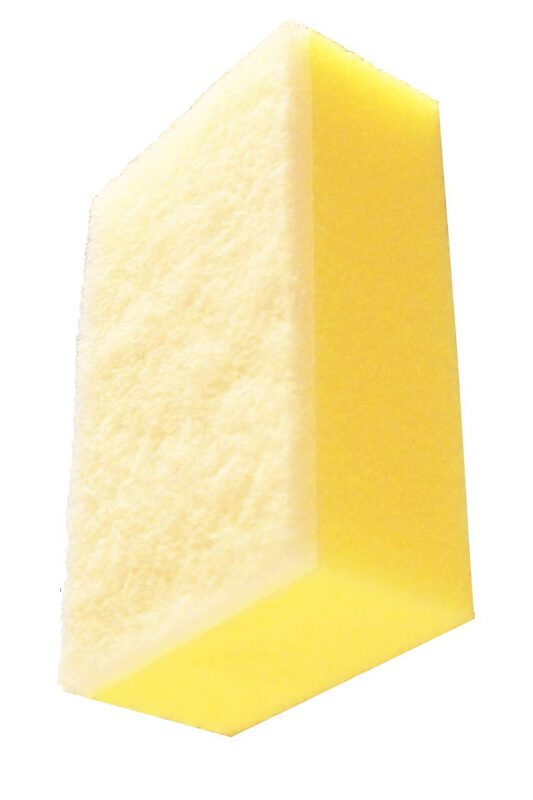 The thicker body of this sponge is about double that of your standard cleaning or kitchen sponge, so it is much easier to grip, or hold for long periods. The larger size also allows it to hold more moisture and cleaning solution, so it will dry surfaces faster, and make scrubbing easier. It won't strain your hand when held for long periods, because you can maintain a wider, more comfortable grip. Use light pressure to wipe surfaces, or and soak up moisture, or increase pressure and use the white scrubbing side to deep clean without harming surfaces. The white scrubbing pad on the bottom of this sponge gives you the power to cut through stubborn grime without worrying about ruining the surface you are cleaning. A durable material is used to create a webbed scrub pad that can remove dirt and other crud that would otherwise require more heavy duty tools to remove. Because it is a non-abrasive pad, it is safe for use on fiberglass, metal, ceramic, glass, marble, granite and more. You can deep clean all of the dirty parts of your bathroom or kitchen without any chance of scratching or marking up the area being wiped. The polyester scrubbing pad is stiff and rigid to the touch, and it gives you the same sort of power as those more dangerous versions, but eliminates any of the risk involved. The soft and squishy foam of the sponge is a standard synthetic sponge material, but it is twice as thick as most other ones. This makes it more comfortable to hold in your hand, but also allows it to absorb more moisture and hold more soap for cleaning. This non-abrasive scrub sponge is a valuable tool for cleaning all over your home. It is ideal when working with Quick N Brite or Scum Off, but would be just as useful if you use other cleaners too. You can scrub your bathtub or shower, or wash down the kitchen sink and this tool will make the job easy. It is perfect for removing greasy build up from your cabinets without ruining the finish, and it works great to quickly scrub away stubborn spots when mopping your floors. Use it to wipe down counters quickly, wash the front of your appliances, remove dirt from shoes, wash dishes, clean bathroom fixtures and so much more. You don't have to worry about where you use it because it offers a safer scrubbing surface that will provide power when cleaning, but will not cause harm unintentionally. It is heavy duty enough to stand up to tough jobs, yet gentle on delicate surfaces when needed. This sponge offers you the perfect mix of scrubbing power and moisture retention. Wipe counters and absorb spills quickly, or soak up enough soap to clean and scrub larger areas without stopping to replenish the soap, or rinse out the dirtiness you collected. It is similar to other versions, but offers unique characteristics that make it easier to use, more tolerable to hold, and more efficient for certain jobs. Order Yours Today! Dimensions (l x w) 5" x 2.8"
Ergonomic Shape Yes. Thicker body with built in grips make it comfortable to hold, and easy to clean with. Scrubbing Pad Yes - non-abrasive scrubbing pad can be used on glass, metal and other similar surfaces. Non-Abrasive Scrub Sponge - The popular sponge that comes with every Quick n Brite or Scum Off purchase. This handy tool is comfortable to hold, and offers significant scrubbing power without harming surfaces. Order Yours Today! LOVE these! They are absolutely great for cleaning! I would recommend them to anyone who cleans for a living or just for using around the house. My Samsung stainless steel refrigerator has a spray clearcoat to protect from finger prints, will this sponge damage the coating ? No it will not. Use without worry. I'm looking for non abrasive cleaning pad to not harm my leather interior car seats. Will be be safe to use and not ruin the seats of a 2012 car? You always want to use caution when cleaning leather, but if you're careful, this sponge should work just fine. A Commercial Grade Tool, Complete With Two Powerful Pads. Specially Designed Microfiber Pads for Cleaning Tough Dirt And Stubborn Grime. A Dual Sided Mitt For Cleaning, Scouring, Scrubbing & Polishing.